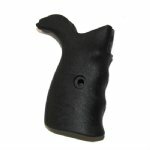 New POF black pistol grip for all HK91, G3, PTR91 and CETME weapons using steel grip frames. Made by an HK licensed manufacturer on HK tooling to exact HK specifications. Product Review: brand new product very pleased ! Product Review: Very nice quality of feel, fit, and finish. Fits tightly on my German made frame.